Shoes by Unforgettable Moments, Image by F8 Photo Studios. This color reminds me of spring, much needed on this grey winter day! This is stunning. There are no other words. Beautiful. So girly and soft and pink! Wow! This was certainly an eye popping post. What a show stopper! thats such a pretty shade of peachy pink. I would not mind getting this box of prettiness in the mail! That peach shade is one of my favorite colors. a box of puppies and cupcakes is the only thing better than a box of beautiful shoes. Ooh... yes, I will accept that delivery. I am seriously coveting a pair of blush-toned silk heels now. GORGEOUS! My H/S graduation dress was that color. Mem-o-ries! 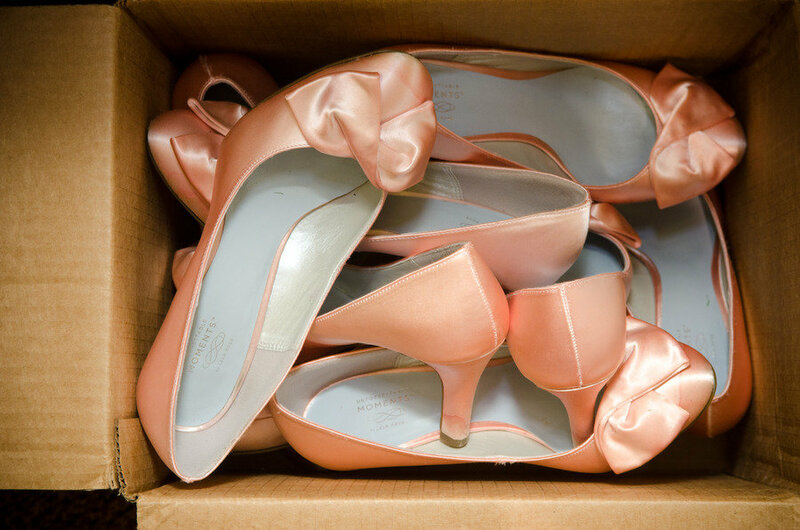 swooning over those peach colored shoes!! absolutely gorgeous!! I think I see a pointe shoe in this box. Stuff that dreams are made of. That is heaven in a box! You're right - simply spectacular! The new site looks great. Adorable name...love it.